Provide comfort for the family of Katherine Gagnier with a meaningful gesture of sympathy. Katherine B. “Kay” Gagnier, 94, formerly of Route 3, West Plattsburgh, passed away on Saturday February 9, 2019 at the Clinton County Nursing Home with her loving family by her side. She was born in Fort Covington, NY (Akwesasne) on October 3, 1924 the daughter of Peter and Louise (McDonald) Back. 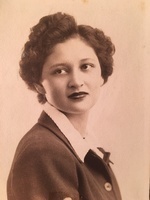 Kay graduated from Bombay High School in 1942 and attended The Malone Commercial School. She moved to Plattsburgh in 1945 and was employed by Mason Dodge as a bookkeeper. Kay married the love of her life, Gerald “Jerry” Gagnier on June 20, 1949. She and Jerry owned and operated Gagnier’s Upholstering from 1963 until 2009. When she wasn’t working at the shop, Kay spent her time, quilting, baking (especially her famous chocolate chip cookies and refrigerated cheesecake.) 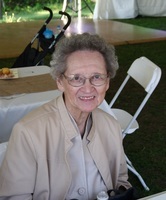 Being a member of St. Alexander’s Church, she was devout catholic and strongly supported catholic education. Kay was predeceased by her parents, her husband Jerry, a sister Melissa, infant brother Peter and several brothers-in-law and sisters-in-law. Kay was most proud of her children and their spouses; Stephen (Cynthia) Gagnier; Mike (Doreen Curtin) Gagnier, Louise (Terry) O’Connell, Irene (Mike) Rock, Chris (Sherry) Gagnier, Mary (Dave) Horton, 12 grandchildren, 12 great grandchildren, a sister Genevieve (Charlie) Peters, a brother-in-law and sister-in-law Robert and Jeanne Stone, several nieces and nephews. Her quiet demeanor and kind heart endeared her to all those who knew and loved her. Truly beautiful inside and out, she will be greatly missed. A Mass of Christian Burial will be celebrated on Tuesday February 12, 2019 at 11:00 am at St. Alexander’s Church in Morrisonville. Interment will be later in the year in the parish cemetery. Donations in her memory may be made to Seton Catholic. To send flowers in memory of Katherine B. Gagnier, please visit our Heartfelt Sympathies Store. Craig, Tonya and Warren sent flowers to the family of Katherine B. Gagnier. Was so sad to hear about your Mom today. What a sweet and special lady she was! I will always have very warm memories of the times I got to spend with your Mom and Dad on K of C business in their shop. We are so sorry to hear of the loss of your mother. Our thoughts & prayers are with you.